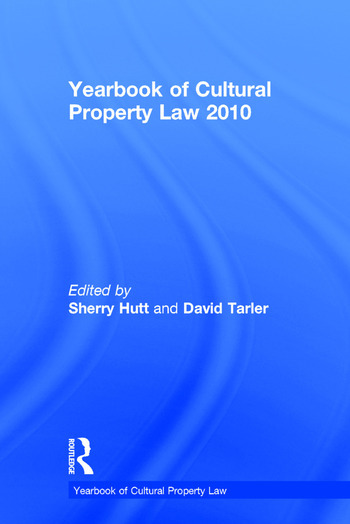 The Yearbooks of Cultural Property Law provide the key, up-to-date information and analyses that keep heritage professionals, lawyers, and land managers abreast of current legal practice, including summaries of notable court cases, settlements and other dispositions, legislation, government regulations, policies and agency decisions. Interviews with key figures, refereed research articles, think pieces, and a substantial resources section round out each volume. Thoughtful analyses and useful information from leading practitioners in the diverse field of cultural property law will assist government land managers, state, tribal and museum officials, attorneys, anthropologists, archaeologists, public historians, and others to better preserve, protect and manage cultural property in domestic and international venues. In addition to eight practice-area sections (federal land management; state and local; tribes, tribal lands, and Indian arts; marine environment; museums; art market; international; enforcement actions), the 2009 volume features an interview with an important figure in the field and original articles on new ICOMOS rules on dispute resolution, Section 47 of the Internal Revenue Code, risk and fair market value of antiquities, the visual artists rights act, and religious free exercise and historic preservation. All royalties are donated to the Lawyer’s Committee on Cultural Heritage Preservation.